Every autumn we revel in the beauty of the fall foliage, but what is the science behind the chemistry of autumn leaves? The vibrant mixtures of red, purple, orange and yellow are the result of many chemical processes, bonds and compounds that take place in the trees as the seasons change from summer to winter. The color causing molecules in autumn leaves contain systems of alternating double and single bonds or conjugation. A large amount of conjugation in a molecule can lead to them being able to absorb wavelengths of light in the visible spectrum. This leads to the appearance of color. The chemical compound responsible for the usual, green coloration of most leaves is chlorophyll while carotenoids and flavonoids contribute oranges and reds and anthocyanins provide vivid red, purple, and magenta shades. 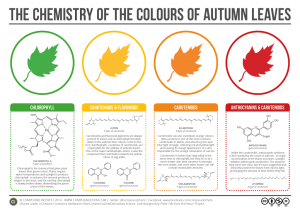 For the full explanation on the science of the seasonal hues, read Compound Interest’s full article The Chemicals Behind the Science of Autumn Leaves. Did you know? In public spaces, foliage in water does not need to be treated with a flame retardant. Turning Star can assist you in determining and delivering the fire resistance services you need to be in compliance with local and national fire codes. Click here for more information.